Lush, screen-printed flowers pop on this comfy, lightweight kimono. Wear it as loungewear or on the go. 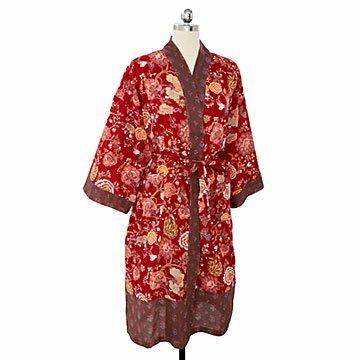 A robe by any other name feels as sweet. Especially when it's made of super-soft 100% cotton like this hand screen-printed kimono. The bold flowers pop on the crimson background, thanks to a meticulous printing technique. Designed and crafted by expert Indian artisans, it makes a memorable wedding, bridesmaid, or holiday gift. And while it's an excellent choice for lounging at home, it's also stylish enough to pair with a tank top and jeans to create an eye-catching outfit. Handmade in India. Machine Wash Gentle. Do Not Bleach. Do Not Dry Clean. Medium Iron. Low Tumble Dry.